Anyone whos visited a major audio show cant help but notice that many loudspeaker companies make ugly speakers. Focus Audio is not among them -- even if their products didnt sound good, theres no arguing that Focus speakers make beautiful pieces of furniture. But Focus speakers arent just pretty faces; in my experience, theyre as easy on the ear as they are on the eye. The FS8 ($2900 USD per pair) is the second Focus Audio model Ive reviewed in the past few months. I was keen to review it because, in its basic layout and cabinet design, the FS8 is very similar to Focuss FC7, which so impressed me last April. While the bargain-priced FC7 ($1400/pair) is a member of the companys Classic line of entry-level products, the FS8 is the top model of their more expensive Signature series. They have similar shapes, but there are many differences between the Classic and Signature speakers, not least the latters better-quality drivers and crossover components. The most obvious visual difference is that the Signature line comes only in a mirror-like black lacquer that Focus says is 1mm thick. Lacquer is a thin material that must be built up a layer at a time; its not hard to imagine it taking days to complete the finishing of a Signature cabinet. The result is worth the effort: the FS8 is gorgeous. Its also a very solid speaker that weighs 50 pounds. The FS8s cabinet is rear-ported, which enhances the speakers high claimed sensitivity of 91dB/W/m, and features two pairs of binding posts to permit biwiring or biamping. Focus says that the FS8s polyester-lacquer finish contributes to the enclosures lack of any notable resonances. Whereas a solid rap with a knuckle on the FC 7 elicits a sharp crack, rapping the FS8 produced a much duller sound -- any energy transferred from finger joint to cabinet was quickly dissipated. Thats a very good indicator that the FS8s cabinet will have minimal effect on the sound, and leave its reproduction to a very capable set of drivers. One criticism I had of the Classic FC 7 was that while it produced deep bass with ease, those low frequencies werent controlled as well as I would have liked. At the time, I speculated that the Classic FC9, the FC7s bigger, dual-woofer brother, would probably address that issue handsomely. So should the FS8, which has two woofers of its own: 5.5" Nomex cones made by Peerless. Although these drivers are quite a bit smaller than the FC7s single 7" unit -- or the FC 9s twin 7-inchers -- they should be more than adequate to reproduce low bass. And because theyre smaller, the 5.5" drivers should also exert excellent control. However, with a claimed frequency response of 40Hz-25kHz, ?dB, the FS8 is clearly not designed to simulate earthquakes. Atop the FS8s cabinet, which measures a tidy 38"H x 7.5"W x 10"D, sits a Scan-Speak Revelator tweeter. The Revelator is a fascinating design that, to me, offers the excellent responsiveness of a good metal-dome tweeter while producing softer, more natural trebles that are never harsh. One of the secrets of the Revelators success is its dual-ring structure: the inner section provides the lightning-fast reaction time of a metal dome, while the outer ring gives the Revelator its characteristic wide dispersion pattern. Readers of my review of the Classic FC7 may remember that I quoted fellow Soundstage! Network reviewer Roger Kanno, who said that the tweeter used in the FC7 "images like crazy," even well off its axis. The Signature FS8s tweeter is a more refined version of the design used in the excellent FC7 -- it had a lot to live up to. Both my reference system and my listening room changed during the course of this review. Two Simaudio Moon models -- an i3.3 integrated amplifier with optional USB D/A converter and a CD3.3 CD player -- took over reference duties from my own Simaudio Moon i5.3 integrated and Benchmark DAC 1 Pre. The new Moons were fed power by, respectively, Synergistic Researchs T3 and T2 mains cables, while Synergistics Tesla Tricon USB cable fed the bit-perfect audio tracks stored on my laptop to the i3.3s internal DAC. The CD3.3 was linked to the amp with TARA Labs RSC interconnects fitted with Crystal Cables Bridge. Speaker cables were my usual Supra Cable Ply 3.4/S, which I continue to use because it sounds so clean and neutral. My room changed more dramatically because I moved. No longer confined to my old basement cell (15 x 12), I now listen to music in a huge 35" x 15" living room. My observations here are of hearing the Signature FS8s in the new space, with some references to the old, smaller room when necessary. Because the Signature FS8s immediately followed the Classics FC7s in my system, I had fresh memories of how the Classics performed in the old house. As the two models share the same overall shape and use a tweeter from the same Scan-Speak family, I positioned the FS8s just where the FC7s had been and . . . nope, that wasnt going to work. Clearly, the FS8s were not carbon copies of their less expensive cousins. I mentioned above that the FC7s tweeter is a dispersion champ even with little toe-in, but the FS8s tweeter was a different animal. It was instantly obvious that the FS8 didnt have the FC7s way-off-axis treble performance, so in the next few days I experimented with varying degrees of toe-in, trying to find their happy spots. Eventually I found that toeing the speakers in about 10 degrees did the trick. The "trick" in this case was a disappearing act. While the FS8s sounded great when listened to directly on axis, I could easily detect their physical positions with my eyes closed. But with the 10-degree toe-in the speakers faded into nothingness, offering the kind of disembodied, holographic sound that digital signal processors strive for but never really achieve. Treble energy was definitely of a different character than with the FC7s, the FS8s Revelators offering a more subtle, refined sound. Attacks and decays seemed accurate down to the millisecond, with nary a shimmer lasting too long, or the leading edge of a sound dispersing too quickly. Despite the fact that the smallish FS8s had to fill a large volume of air in my new home, they provided admirably deep bass that seemed to belie Focuss modest claim for their low-frequency extension. Placed 3 out from the front wall and 3 from the sidewalls, the speakers twin 5.5" woofers offered solid, punchy bass at 41Hz (E1 on the double bass), as evinced by Ray Brown, Christian McBride, and John Claytons acoustic thunder on Superbass 2 (CD, Telarc CD-63483). Despite the great mass of my solid-wood coffee table, there were moments during the trios cover of "Papa Was a Rolling Stone" when I wondered if it would begin sliding away from me. The FS8s were equally adept with pounding rock, such as "Murder City," from Green Days 21st Century Breakdown (CD, Reprise 517153), and "Rock n Roll Train," from AC/DCs Black Ice (CD, Columbia 739238) -- and were absolutely lifelike playing the "Drum Kit Test" on Ray Kimbers Isomike Recordings 2005B test disc. I enjoyed the last track so much that I played it several times in a row, wishing each time that it was longer than 90 seconds. In the all-important midrange, the Signature FS8 continued to wow me. "It Never Entered My Mind," from Carol Kidds Dreamsville (FLAC download, Linn Records 24/96 Studio Master), is a beautifully simple recording that sounds good on pretty much everything, but becomes compelling and moving on gear like this. Kidd never seems to raise her voice much above a whisper, yet imbues songs with more emotion than a Shakespearean tragedy -- subtleties beautifully resolved by the Signature FS8s. Male vocals were reproduced with much the same brilliance; once I thought I could even make out some words sung by Bob Dylan. The more speakers I listen to, the more I realize that not every company seems to know how to integrate speaker drivers into a cohesive-sounding whole. Focus Audio, however, is one that does -- their Signature FS8 was a model of tight, seamless integration. When they were set up correctly and powered by quality electronics, it took a lot of concentration for me to discern where one driver left off and the next one took over. The spec sheet tells me that the FS8 has a crossover, but Ill be darned if I could hear it. Focus Audios Signature FS8 is a killer speaker by almost every measure: It looks fantastic, it sounds wonderful, and its price is something many can afford. In very large spaces -- such as my new living room -- the FS8 may need some reinforcement at the lowest frequencies, but it still packed plenty of punch with double bass and kick drum, which will be more than enough for most listeners. 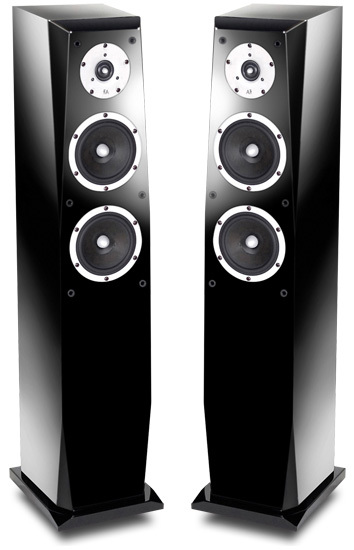 There are many speakers that cost $3000/pair or thereabouts, but few offer the combination of build and sound quality found in the Signature FS8. This speaker is easy enough to recommend that Im tempted to urge you to just go out and buy a pair without bothering to listen to any of its competitors. But do go out and listen to what some other speaker makers think is worth $3000 -- then youll know how great a speaker, and how tremendous a bargain at $2900/pair, Focus Audios Signature FS8 really is.